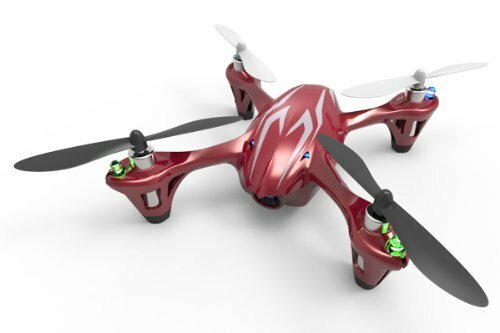 Main Features: Latest 6-axis flight control system with adjustable gyro sensitivity Permits super stable flight. With 4 channels Lightweight airframe with nice durability 4-ways flip(left, right, forward, backward) USB charging cable allows charge by computer. Camera: video recording module included (requires a Micro SDHC card) Able to fly outdoors Includes: 1 x Hubsan X4 H107C R/C Micro Quad Copter with Camera 2.4GHZ 1 x 2.4G Remote Controller (does not include batteries) 1 x USB charging cable 1 x 3.7V 380mAh LiPO Battery 1 x Protection Ring 1 x U Wrench 4 x Rotating Blade Specifications: Motor (x4): Coreless Motor Frequency: 2.4GHz with 4 channels Battery: 3.7V/380mAh Camera: video recording module included (memory card: micro SDHC is not included.) Flight time: about 7 minutes Charging time: 40 minutes Product size: 2.7 x 2.7 x 1 inches Box size: 14 x 3.6 x 7.2 inches Weight (include box): 1 lb. 2.4 oz. Note: This R/C model is not a toy! RC model helicopter is not toy and is not suitable for children under 14 years. Keep it away from children. If you are beginner, it is recommended to be assisted by an experienced helicopter pilot. HUBSAN HOBBY international reserves the right to modify the model without prior notice. If you have any questions about this product by HUBSAN, contact us by completing and submitting the form below. If you are looking for a specif part number, please include it with your message.